The Manning equation is a widely used and very versatile formula in water resources. It can be used to compute the flow in an open channel, compute the friction losses in a channel, derive the capacity of a pipe, check the performance of an area-velocity flow meter, and has many more applications. How can one equation do so much? In this post, I provide an introduction to the Manning’s equation and then dive into the details of how this equation works and provide several examples of how it can be used in various water resources applications. The Manning equation is an empirical equation that describes the relationship between the velocity in a conduit and the channel geometry, slope, and a friction coefficient expressed as a Manning n. In its essence, the Manning equation describes the energy balance between gravity and friction in a conduit. It is an empirical equation because it is not based on first principles formed from theories of science and physics, but rather it is derived from curve fitting to observed data. There is nothing wrong with using such an equation in engineering, so long as we keep in mind that it is empirically derived and that there are limitations to its use. You might wonder – why do we use an empirical equation for this and not use one based on first principles of physics? The answer is simple – turbulence. Most pipes and channels flow under turbulent conditions. And we do not yet have a sufficient scientific understanding of turbulence to derive equations based on first principles. The Manning equation was developed by Robert Manning in the late 19th century. It is interesting to note that Manning had no formal training in fluid mechanics or engineering. His background was in accounting, which caused him to search for the simplest solution that best fit the data. This is consistent with the law of parsimony, which states that things should not be needlessly multiplied, and that all things being equal, the simplest explanation is often the best. This concept is also sometimes referred to as Occam’s razor. He compared and evaluated seven best known formulae of the time for the flow of water in a channel: Du Buat (1786), Eyelwein (1814), Weisbach (1845), St. Venant (1851), Neville (1860), Darcy and Bazin (1865), and Ganguillet and Kutter (1869). He calculated the velocity obtained from each formula for a given slope and for hydraulic radii varying from 0.25 m to 30 m. Then, for each condition, he found the mean value of the seven velocities and developed a formula that best fitted the data. On December 4, 1889, at the age of 73, Manning first proposed his formula to the Institution of Civil Engineers (Ireland). This formula saw the light in 1891, in a paper written by him entitled “On the flow of water in open channels and pipes,” published in the Transactions of the Institution of Civil Engineers (Ireland). Through his “Handbook of Hydraulics,” King (1918) led to the widespread use of the Manning formula as we know it today, as well as to the acceptance that the Manning’s coefficient C should be the reciprocal of Kutter’s n.
The Manning equation was developed using observations from a stream gauge like this. Q is the flow rate expressed in cubic feet per second. The equation above is expressed in flow, because both sides of the equation have been multiplied by the flow area, A. The left side of the equation could also be expressed as V * A, because V * A is equivalent to the flow through the continuity equation. Also note that the equation could be used to compute the velocity, V, rather than the flow, by removing the area, A, from the right hand side of the equation. 1.49 is a units conversion factor. This coefficient is not needed (or is set equal to 1) for metric units. n is the Manning’s roughness factor. This is a unitless value that represents the roughness factor of the conduit. More on the Manning n value below. A is the cross sectional area of the flow expressed in square feet. As noted above, the area can be removed from the right hand side of the equation, which will result in computing the velocity from the equation, rather than the flow. R is the hydraulic radius expressed in feet. This is the variable in the equation that accounts for the channel geometry. Hydraulic radius is computed from the area divided by the wetted perimeter of the flow. The wetted perimeter is literally just like it sounds – it is the length of the conduit around the perimeter that is wet. For example, for a round pipe flowing half full, the wetted perimeter would be half of the pipe circumference. For a round pipe flowing full, the wetted perimeter would be the pipe circumference, and the hydraulic radius would be equal to the diameter divided by 4. S is the slope of the energy gradient expressed as a raw slope (not a percentage) in feet per feet. It is common to substitute the channel slope for the energy slope to make computations of uniform flow depth in an open channel (when the depth is a constant at different locations along the length of the channel), but this is not the general form of the equation. In the general form, the slope of the energy gradient is used, which represents the rate that the conduit is losing energy as a result of friction. This general form of the equation allows it to be used to analyze conduits that are flowing under a variety of conditions, not just uniform flow. More on this below. The Manning’s n value is a unitless coefficient that represent the roughness or friction factor of the conduit. Rougher conduits with higher friction have a higher value, and smoother conduits with lower friction have a lower value. The form of the Manning equation should make sense with the Manning n in the denominator (bottom) of the equation. With all other things being equal, a higher n value, representing a higher conduit friction, would result in a lower flow rate. This should make intuitive sense, as more friction would tend to slow the flow down. Because the Manning equation is an empirical equation, the values for Manning n are derived from experiment and observation. There is no hard, fast rule or scientific method to determine what Manning n to use for a particular conduit. Most commonly, the conduit characteristics are examined, and then the Manning n is looked up in a reference table. 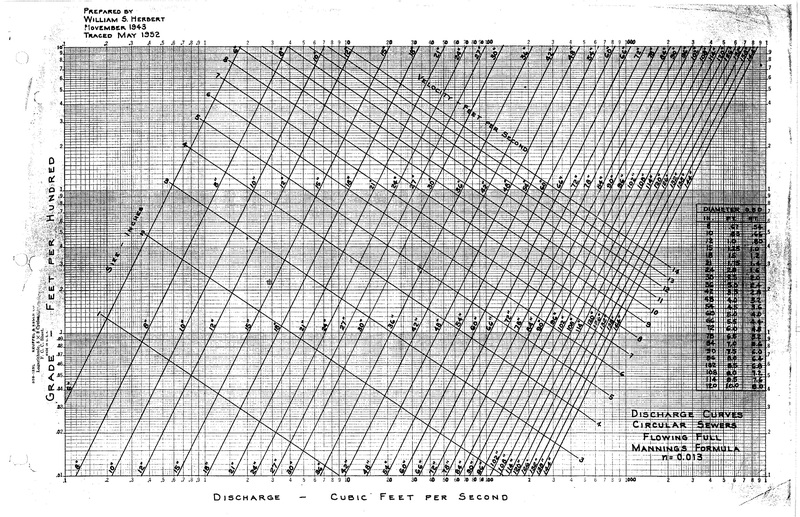 Here is a useful table of Manning n values excerpted from Chow, Open Channel Hydraulics, 1959. A very common value for Manning’s n is 0.013 for concrete conduits. Note that the Manning n table contains a range of values for the Manning n for each conduit type. This reflects the empirical nature of the equation and the fact that there is some natural variability in the conduit frictional characteristics, and inherent inaccuracies in the use of the formula. Take the ranges on Manning n published in these tables as a note of caution – the equation is not perfect, nor perfectly precise. Please keep that in mind when evaluating water resource systems and consider the inherent variability in the equation when evaluating the impacts of your engineering decisions. Below are some examples of common conduit types and their resulting Manning n.
The Manning equation is very versatile and can be applied to many different applications in water resource systems. Below are some common uses of the equation with a brief description of how the equation works for each. The Manning equation is widely used in analysis of open channel flow. It is very common to use the equation to compute the uniform flow depth, which is described below. But more generally, the equation can be used to compute the channel friction, and therefore the open channel flow profile along the length of the channel. Computing the profile along the length of an open channel means computing the depth at various locations along the length of a channel. This is often done for evaluating the floodplain elevation for rivers. The Manning equation can be used for this purpose by rearranging the equation to express the slope (of the energy gradient) as a function of the flow, Manning n, hydraulic radius and area, as shown in the equation below. When the items on the right hand side of the equation are known at one point in the channel, the depth at another location of the channel can be computed using the Manning equation. This is done by plugging these values into the Manning equation and computing the slope of the energy gradient. This slope is then applied to a given length of the channel, and the change in elevation of the energy grade line is computed. The hydraulic grade line (or depth profile) can then be computed by subtracting the velocity head (V^2 / 2g) from the energy grade line. This process is repeated working your way along the length of a channel to compute the depth at the desired locations in the channel. Often such an analysis is started at a location in the channel where the channel depth is known, or can be computed using standard formulas for a hydraulic control like a dam, weir or sluice gate. The computational process described above can then be used to determine the open channel flow profile. If you do this, please be aware of the impacts of critical depth and whether the channel is flowing under subcritical or supercritical conditions, as these can have a significant impact on how the analysis is performed. Programs like HEC-RAS are often used to compute the flow profile for open channel flow. Uniform flow is a phenomenon that occurs in open channel flow. Uniform flow simply means that the depth of flow is the same along the length of the channel. This also means that there is a balance between gravity and friction in the channel. Given enough distance away from a hydraulic control structure, the flow will always approach uniform flow depth. The term “normal depth” is sometimes used to refer to the depth in a channel flowing under uniform flow conditions. The Manning equation can be used to compute uniform flow depth by assuming that the slope of the energy gradient is equal to the channel slope, and then using the equation to derive the depth for a given flow. Setting the slope of the energy gradient equal to the channel slope results in the height of the energy grade line being a constant at any location along the channel. Therefore, the height of the depth will also be a constant at any location along the channel. This is why it is called the uniform flow depth. Although the Manning equation is often used in open channel flow, it can also be applied to full pipe flow. One common application of the equation is to compute the full pipe capacity for a given diameter and pipe slope. This is done with the Manning equation by setting the slope equal to the slope of the pipe, and then computing the resulting flow rate for a given pipe diameter. Setting the slope of the energy gradient equal to the slope of the pipe results in computing the flow rate that will just keep the pipe full along its length, which is how the capacity of a pipe flowing under gravity conditions is defined. The Manning equation can also be used to solve for the required pipe slope to achieve a given capacity for a given pipe diameter. There is a hydraulic calculation widget in H2Ometrics that performs these calculations automatically and can solve for either the pipe slope or pipe capacity. Below is a nomograph that can be used for the same purpose, for pipes with a Manning n of 0.013. Here is a link to a full pipe capacity spreadsheet using the Manning equation. The Manning equation can also be used to used to compute head losses in a pipe flowing full. The procedure for this is really no different than the process described above for computing the flow profile in an open channel. The conduit geometry is simpler because it is derived from the full pipe geometry. The Manning equation is rearranged to express the slope (of the energy gradient) as a function of the flow, Manning n, hydraulic radius and area of the pipe, as shown above. These items are entered into the equation, and the slope of the energy gradient is computed. This slope is then applied to the length of the pipe, and the change in elevation of the energy grade line, or the head loss in the pipe is computed. Here is a Manning head loss spreadsheet for full pipes. Note that the spreadsheet also contains the ability to compute minor losses due to items like bends or manholes as well. The Manning equation can be used to check the performance of an area-velocity flow meter. This is done by making a scatter plot of the depth versus flow measurements from the flow meter and comparing the results of the scatter plot to the results of the Manning’s equation. The details of this process are covered in a previous blog post entitled What is a Scatter Plot? ADS has a nice series of scatter plot examples that walk through several different scatter plot types and what each one might be indicating about the sewer system. These can be helpful for diagnosing sewer issues from scatter plot data. You can even contact them and they will send you a free poster of the scatter plots. H2Ometrics is a cloud-based water and sewer data analytics platform. We collect data from sensors like flow meters, rain gauges and depth monitors, store and host it on our cloud server, and then provide browser-based analytics tools to get value out of the data. H2Ometrics provides many hydraulic calculators to aid in making calculation using Manning’s equation and contains modeling and scatter plot tools to help analyze flow data using the Manning equation. To learn more, please see the overview of the platform, our customer case studies, and demo videos that show the tools in action. I doubt that Manning is accurate at slopes above about 2 degrees. I am designing a tank to drain to a second tank through 2″ tubing sloped 33 degrees from vertical. Both tanks are open to atmosphere. The first tank has a 2″ diaphragm type bottom outlet valve (Cv=49). With 4′ feet of water in the first tank the initial flow rate will be 120 gpm. Manning predicts that this flow will half fill the outlet tube and a velocity of 14 fps. This is not believable to me. I think the reason is that Manning it not accurate at such high slopes. Manning doesn’t work with pressure flow very consistently. You have water above the pipe (4-feet from what I understood) which is the driving force and not the pipe slope (or energy grade line). You need tobuse Hazen-Williams or Bernoulli’s equations to accurately represent the flow and headless.